Tags can be added via the front-end or back-end of your Joomla site, there is a special setting to allow you to define if users can create new tags from the front-end, or only select from the tags that are already available. Ensure that you have edit permissions, without edit permissions you will not be able to edit documents and manage tags. DOCman allows to either add new tags or select them from the existing list of tags created through the administrator tags manager. You can configure if new tags can be added through the document form in the DOCman > Settings > Global permissions settings. 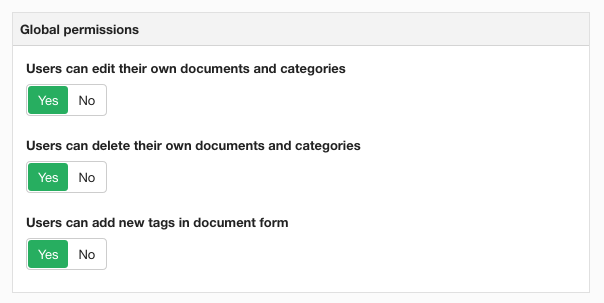 By default users with edit permissions can add new tags through the document form on the frontend. Once a document has been created you can access it from the list of documents through the different layouts DOCman offers. When you click on the Edit button you will be able to access the fully featured DOCman front-end editor. You can select from an existing tag or add a new tag. Go to Administrator > Components > DOCman > Tags. Click New to create a new tag. Go to Administrator > Components > DOCman. Open an existing document or create a new document. Under Tags search for an existing tag or automatically create a new tag. Tip: By default users can create new tags straight from within the input field. You can disable this in DOCman's Settings when users should only be able to choose from the pre-defined tags. 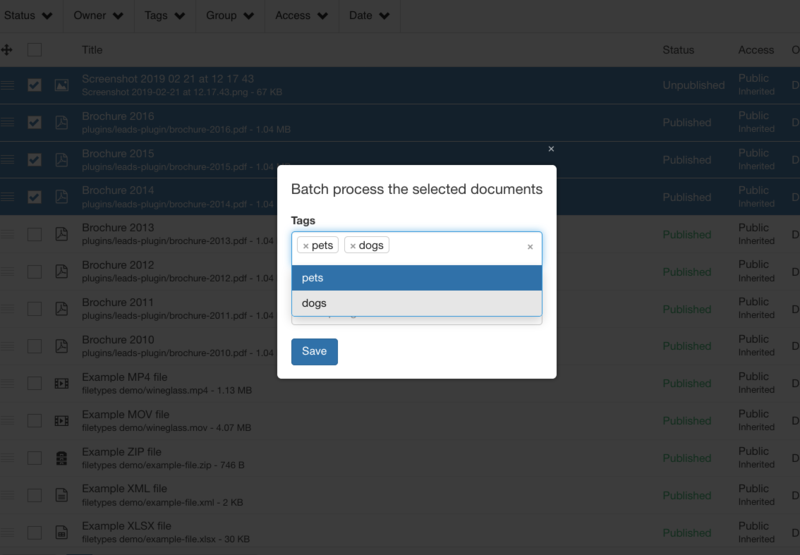 Select the existing documents that you want to batch add tags to. Click on the Batch button in the toolbar at the top of the page. In the resulting pop-up window, under Tags search for an existing tag or automatically create a new tag.